THE sight of Dickie Bird on the big screen in familiar white coat signalling fours, sixes and wickets was a novel one on the opening night of Yorkshire’s T20 campaign. The former umpire could be seen running through his repertoire of hand signals and gestures in a pre-recorded routine that tickled the 6,133 crowd. 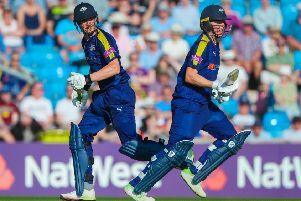 Unfortunately for Yorkshire, most of the fours and sixes that Bird confirmed came off the bats of the Leicestershire players, and most of the wickets were those of the Yorkshire batsmen. At the end of it all, Leicestershire won by 54 runs after scoring 174-7 from their 20 overs, Yorkshire replying with 120. The sight of a deadpan Dickie rolling back the years was just about the only thing that did tickle the Yorkshire crowd on an otherwise unhappy evening for the home support. Having made a big play of wanting to do well in this year’s competition (chief executive Mark Arthur is expecting at least a place in the quarter-finals), this was clearly not the start that Yorkshire had in mind. Yorkshire's Andrew Hodd appeals unsuccessfully for the wicket of Leicestershire's Niall O'Brien (Picture: Allan McKenzie/SWpix.com). Indeed, practically the only spin that could be put on it was that it was Yorkshire’s first match in this year’s tournament (Leicestershire were playing their second fixture) and that ring-rustiness might have played a part. But the reality was that Yorkshire were outplayed by a side who did not have to perform particularly well to beat them, just solidly enough to get the job done in a contest strewn with basic errors. On a night when Alex Lees led Yorkshire for the first time since his appointment as permanent one-day captain, Yorkshire made the perfect start when Tim Bresnan began with a wicket maiden. Yorkshire have missed the former England all-rounder, who had been out for two months with a calf injury, and he struck with the fifth ball of the match when Mark Pettini pushed to point. James Wainman, playing his first senior T20 game, conceded 10 from his opening over at the other end, but the left-arm pace bowler did not have to wait long for his first wicket, having the dangerous Mark Cosgrove caught at deep square-leg. Leicestershire, who scored 48-2 in the six-over powerplay, lost their third wicket in the seventh over when Kevin O’Brien chipped Liam Plunkett to mid-on. Plunkett struck again when Umar Akmal miscued a pull to mid-off, the pace bowler returning Yorkshire’s best figures of 2-23. Leicestershire were stalling at 83-4 off 13 overs before a sudden injection of pace inspired by Ben Raine and Niall O’Brien. All of a sudden, the digital Dickie was signalling boundaries left, right and centre while Yorkshire did not help themselves at times with some sloppy ground fielding and several dropped catches. Raine, who eventually holed out to long-on, top-scored with 48 from 43, while O’Brien picked out backward square-leg after striking 39 from 21. Tom Wells was taken at deep mid-wicket in the penultimate over, with 22 arriving from the final over bowled by Ben Coad, and 102 from the last 10 overs of the innings. Yorkshire’s reply was soon in distress when Adam Lyth picked out mid-off. Lees was caught around the corner and Rashid, promoted to No 3, caught behind as the hosts fell to 20-3. Wickets continued to fall as Jack Leaning was brilliantly caught at mid-off by a diving Raine and Gary Ballance snaffled at short fine-leg. The big-hitting Bresnan and Plunkett were held in the deep on the leg-side and after Andrew Hodd was bowled, Will Rhodes fell for the top-score of 45 from 26 balls when he picked out long-off to leave the home team 109-9. Raine rounded things off by bowling Coad with eight balls remaining, finishing with outstanding figures of 3-7 from 3.4 overs. Reigning champions Lancashire’s stuttering Natwest T20 Blast defence continued as they lost their second straight game. The County Championship leaders suffered a six-wicket defeat to Durham at Old Trafford – following a heavy nine-wicket reverse to Derbyshire last week – to leave them bottom of the northern group after their opening two games.